A group of Wilmington artists teamed up to produce “Tight Like That”. A portion of the proceeds from tune purchases will benefit The Wilmington Fund VT.
Singer Peggy Hayes & Guitarist Colby Dix recorded the song written by Steven School and Joseph Cincotta at Northern Tracks Studio, with a great debt to Gary Henry’s production skills. 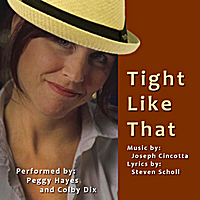 Playful, romantic and fun — “Tight Like That” is a departure of sorts for jazz singer, Peggy Hayes, but she put her unique indie style to work on the tune as a labor of love for dear friend Joseph Cincotta. Peggy shows versatility by venturing into Alternative Folk with “Tight Like That,” an indie anthem-style song penned by Steven Scholl and put to music by Joseph Cincotta. This is the first published song for Cincotta and Scholl. Peggy shows versatility by venturing into Alternative/Progressive Folk with “Tight Like That,” an anthem-style Indie tune. Colby steps up to the plate with his bass lines to the delight of Scholl, Cincotta and Henry.